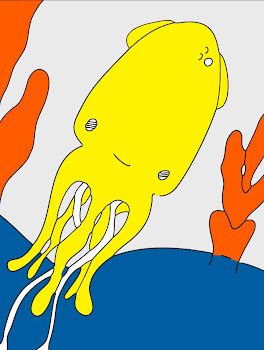 Technicolor Squid: Well, It's A Start At Least. Okay, the blogger settings have been edited. Yay! Now, we have to work on making this a little bit prettier and adding the other pages. If you are here via bloglines or seeing this via bloglines then yippee! I have finally moved the site feed over to this new atom.xml and I have claimed both of these feeds (something I could not do with iweb or golive). This is a part of the reason why I finally made the choice to move back to blogger. I want consistency, but the software that I originally started with did not really provide that. Hopefully, cute buttons will be back today and then a new shop (sans Etsy)! I will get the links set up to all of you lovely people and the other pages reconstructed. Later I will rebuild the older posts and hopefully we will be settling in this new blog home. I have some new little paintings to show you and my right arm/hand are feeling much better now so I can spend some quality time on the computer. Yay and Yay! Hugs to all of you delightful people and welcome to our new space! xox=vv. new paintings?? well that is definitely worth the wait! I got here via bloglines too, it's working.. I owe you an e-mail miss C, so sorry! Yep I'm here through bloglines. Oh yay! Thank you all so very very much for helping me figure this whole blog/rss/atom thing out. Dear Kirsty - Thank you! What a wonderful first post in this new space! Lovely Lisa - You are just such a sweetie. I am not sure the paintings are really worth the wait but I am awfully glad that you might be waiting with me!! Oh Cutie Miss Kuky - Thank you! The Sampler is a lot of fun. It is definitely worth trying out. I hope you are all having a wonderful day!! xox=vv.